BNL | History:The First Video Game? Before the era of electronic ping pong, hungry yellow dots, plumbers, mushrooms, and fire-flowers, people waited in line to play video games at roller-skating rinks, arcades, and other hangouts. More than fifty years ago, before either arcades or home video games, visitors waited in line at Brookhaven National Laboratory to play “Tennis for Two,” an electronic tennis game that is unquestionably a forerunner of the modern video game. Tennis for Two was first introduced on October 18, 1958, at one of the Lab’s annual visitors’ days. Two people played the electronic tennis game with separate controllers that connected to an analog computer and used an oscilloscope for a screen. The game’s creator, William Higinbotham, was a nuclear physicist lobbied for nuclear nonproliferation as the first chair of the Federation of American Scientists. Higinbotham realized how static and non-interactive most science exhibits were at that time. As head of Brookhaven Lab’s Instrumentation Division, he would change that. While reflecting on his creation, Higinbotham wrote, “it might liven up the place to have a game that people could play, and which would convey the message that our scientific endeavors have relevance for society." Hundreds of visitors lined up for a chance to play the electronic tennis game. And Higinbotham could not have dreamed that his game would be a forerunner to an entire industry that less than fifty years later, would account for $9.5 billion in sales in 2006 and 2007 in the U.S. alone, according to a report published by the Electronic Software Association. In 1982, Creative Computing magazine picked up on the idea that Tennis for Two might be the first video game ever and it published a story on the game in that year’s October issue. It credited Higinbotham as the inventor of the video game — until they heard from someone who could document an earlier game. The same story was reprinted in the Spring 1983 issue of Video and Arcade Games, a sister magazine to Creative Computing. 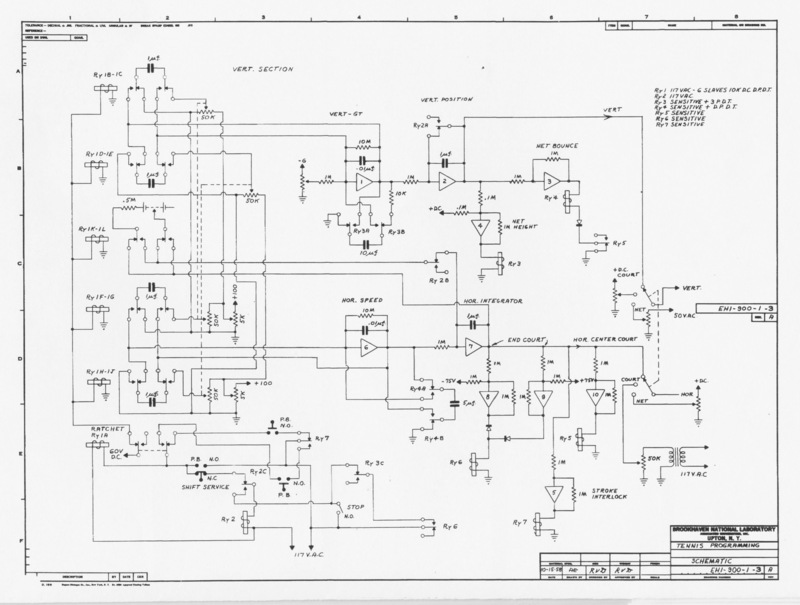 One of the original electrical schematics for Tennis for Two. Higinbotham used four of the computer’s operational amplifiers to generate the ball’s motion while the computer’s remaining six amplifiers sensed when the ball hit the ground or net and switched controls to the person in whose court the ball was located. In order to generate the court, net, and ball on screen, it was necessary to time-share these functions. In 1958, when Tennis for Two was first introduced, the oscilloscope display was only five inches in diameter. In 1959, the game was improved. A larger screen between 10 and 17 inches in diameter was used and players could select variations of tennis on the moon, with low gravity, or on Jupiter, with high gravity. A later incarnation of Tennis For Two from 1961. Considering Higinbotham’s background, Tennis for Two was a natural outgrowth of his schooling and work experience. During his senior year at Williams College, he used an oscilloscope to produce a system to display the audio modulation of a radio station's high frequency radio output. As a graduate student in Cornell's physics department, he worked as a general-purpose technician, learning the new and rapidly developing field of electronics. In 1940, Higinbotham joined the staff of the MIT Radiation Laboratory and worked on cathode-ray tube displays for airborne, ship-borne, and land-based radars. This involved designing a way to display radio waves that echoed or bounced back off distant targets. Later, Higinbotham worked on the Eagle radar display system, which showed the radar returns of ground targets as seen from a high-flying B-28 airplane. The picture of the target area stood still on the display, in spite of the yaw, pitch, or roll of the aircraft while maneuvering toward the target. This work led to patents for circuits that used operational amplifiers like those in the analog computer used for the tennis game. All in all, when Higinbotham designed Tennis for Two, he incorporated much of what he had done before. As he recalled, it took about two hours to lay out the design and a couple of days to fill it in with components on hand. Brookhaven Lab technician Bob Dvorak put it together in about three weeks, and the two of them took a day or two to debug it. 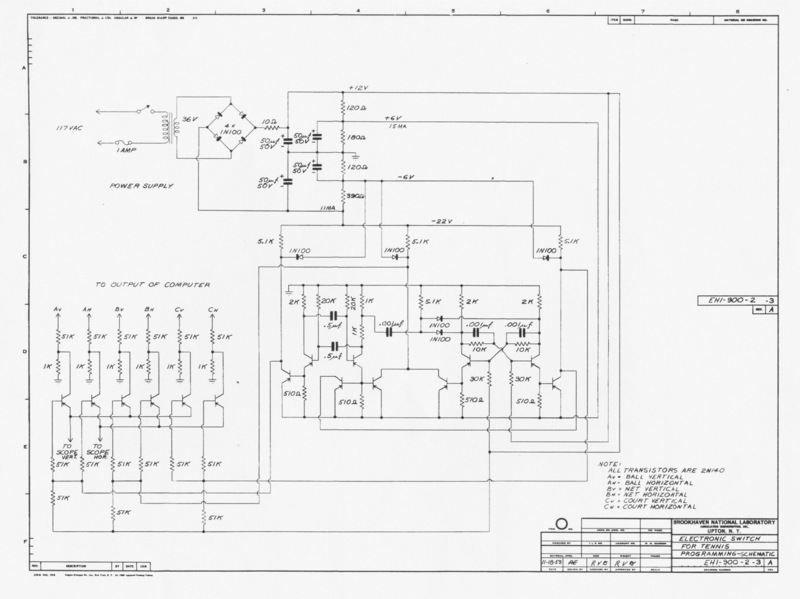 The Lab still has official blueprints dated 1958. Was 'Tennis for Two' the First? Higinbotham’s Tennis for Two was actually preceded by several other inventions — one in the late 1940s and two in the early 1950s. But it would not be fair or correct to award the title of “the first video game” to any one of these specific inventions. In 1948, ten years before Higinbotham’s Tennis for Two, Thomas T. Goldsmith Jr. and Estle R. Mann patented the “Cathode-Ray Tube Amusement Device,” making this currently the earliest-documented video game predecessor. The amusement device, however, required players to overlay pictures or illustrations of targets such as airplanes in front of the screen, dovetailing the game’s action. This was unlike Higinbotham’s Tennis for Two, which entirely displayed the game’s visuals on the screen. Another video game-like device, the Nimrod computer, was built by Ferranti International and first displayed at the Festival of Britain’s Exhibition of Science in 1951. Although the computer was built to play the century-old game of logic and strategy called “Nim,” the electronic version of the game was specifically designed to demonstrate the processing power of the new computing device. This was in contrast with Tennis for Two, which was designed to be played for fun. In addition, the Nimrod computer did not use a cathode-ray tube display with elements that appeared to “move” on screen like Tennis for Two. Instead, it used a set of fixed lights that turned on and off and a legend to describe what was happening throughout the demonstration. Then, in 1952, A.S. Douglas at the University of Cambridge created an electronic version of Tic-Tac-Toe, which he titled “OXO” (or Noughts and Crosses). This single-player “game” was designed for academic purposes — Douglas used the electronic OXO on the famous Electronic Delay Storage Automatic Calculator, or EDSAC, to study the “Interactions Between Human and Computer.” Like electronic Nim, electronic OXO was not designed to be entertaining. Some argue that Tennis for Two or any one of the earlier predecessors to the modern video game cannot be titled the first “video” game because not one of them displayed a “video” signal. The term “video” implies that electronic signals are converted to images on a screen using a raster pattern, a series of horizontal lines composed of individual pixels. Although older oscilloscopes, televisions, and computer screens all used cathode-ray tubes, oscilloscopes visually display changes in electrical voltage; they do not use the raster process. While Higinbotham’s system did not create a video signal, he had created a unique way to alternate among the computer’s outputs with the transistor switching circuit, creating the image of a tennis court and allowing players to control a movable ball seen on a screen, just like a modern video game. A recreation of the original Tennis For Two constructed for the 50th anniversary of the game's first appearance. Years after Higinbotham built Tennis for Two, the game received notoriety in the legal system. In the mid-1970s, Higinbotham's game was "discovered" and brought into legal battle against the first video game patent, held by Magnavox. Higinbotham made the following deposition and notes during that time period. Also provided here are the original game's schematics. In retrospect, Higinbotham agreed he should have applied for a patent. But if he had, the patent would have belonged to the federal government, and no riches would have come his way, anyway. According to Higinbotham, the reason he did not apply was that at the time, the game did not seem to be any more novel than the bouncing ball circuit in the instruction book. Higinbotham, who died in 1994, wished to be known for his work on radar displays and his efforts to slow the nuclear arms race. Little did he know that Tennis for Two, the game he had created for Brookhaven Lab’s open house in 1958 to entertain visitors and convey the relevance of scientific endeavors for society, would lead to Pong, Pac-Man, Mario, new video game systems and new video games, magazines, and Congressional debates. He might have guessed that it would lead to fun.